Today, Wireless Network has become more and more present in open area or large companies and security enhancement is needed to control authentication and confidentiality. The 802.11 Working Group introduced the 802.11i amendment as the final stage of the Robust Security Network standard, superseded the old WEP technology. Today we’ll show you a detailed step by step tutorial which explains how you can connect to a Wi-Fi network in Kali Linux from terminal. iw is a new nl80211 based CLI configuration utility for wireless devices. It supports all new drivers that have been added to the kernel recently. The old tool iwconfig, which uses Wireless Extensions interface, is deprecated and it’s strongly recommended to switch to iw and nl80211. From above output, it seems that we’ve only single wireless adapter whose interface name is “wlan0” and designated as phy#0 and of type managed (means the device is a Wi-Fi station or client that connects to an access point) and hardware address (Mac Address) is 42:97:d7:db:b7:ef. Alternatively, you can also find out all the above things by typing “iwconfig“. ip is used to show / manipulate routing, devices, policy routing and tunnels. It is used for enabling/disabling devices and it helps you to find general networking information. You can also check the WiFi network connection status by typing “iw wlan0 link” which shows Not Connected at this time, because we didn’t connect yet. 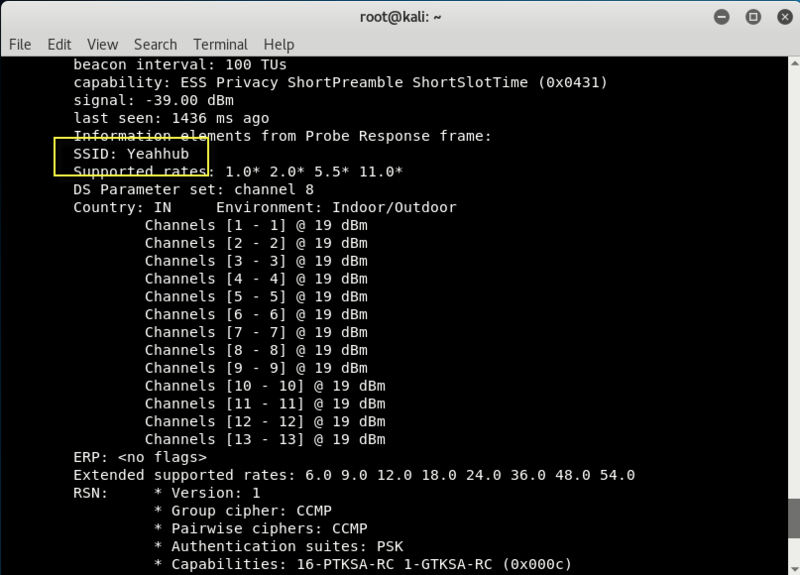 In below screen, as you can see that the SSID name is “Yeahhub” which we need to connect and the security protocol is RSN, also commonly referred to as WPA2 Protocol. In this case, our Yeahhub wireless password is “12345678“. Use the iw command to verify that you are connected to same SSID or not. If in case, you aren’t getting any IP Address, then you can easily get it via “dhclient wlan0” command. You can also confirm it by typing “ifconfig wlan0“. The last configuration step is to make sure that you have the proper routing rules which you can confirm by typing “ip route show“. Now Ping Google’s Public DNS IP to check the network connectivity or simply you can browse any website.